Marco! Polo! · Exploring Microservices — Game On! An item long on our wishlist was to stop having hardcoded endpoint urls (passed in as environment variables) for our services. We know it isn’t nice, and it makes it harder to scale service instances without adding intermediate proxies all over the place. We’re using Amalgam8 (A8) for it’s service discovery and service proxying abilities. 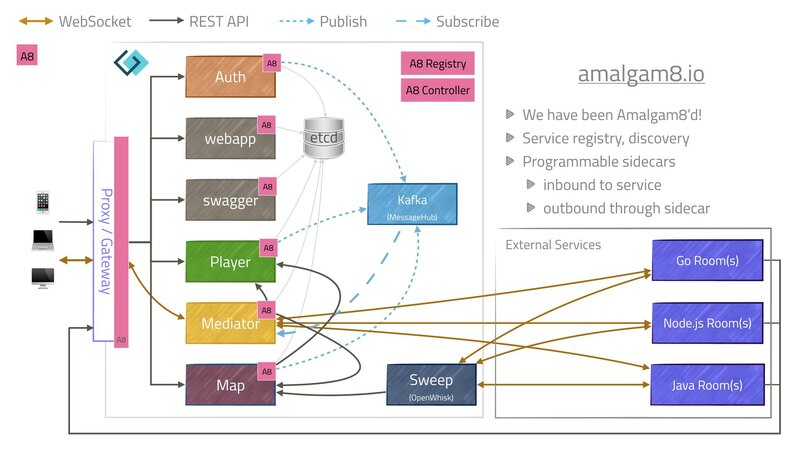 Amalgam8 uses sidecars to manage service registration and discovery. Programmable load balancing and routing is provided via an in-container outbound proxy to other services. This simplifies how much our services have to deal with. In effect, our services are still using fixed URLs passed in via the environment, but the A8 sidecar is translating that fixed URL into a point to point connection with the target remote service. When Mediator wishes to talk to Map to discover which room is behind an Exit, it no longer talks to a fixed remote endpoint configured via etcd, but instead talks to its in-container proxy, asking for the Map service via a known local url. A8 then handles connecting the request to the correct service instance running in another container.